Early Tuesday morning at the E3 gaming expo, Sony and Insomniac Games gave us another amazing look at the PS4 Spider-Man game dropping this September, introducing us to a few of Peter Parker’s worst enemies... six of them, in fact. In the comics, six is a rather unlucky number for Spidey, because it’s the size of one of his most infamous villain teams, the aptly named Sinister Six. 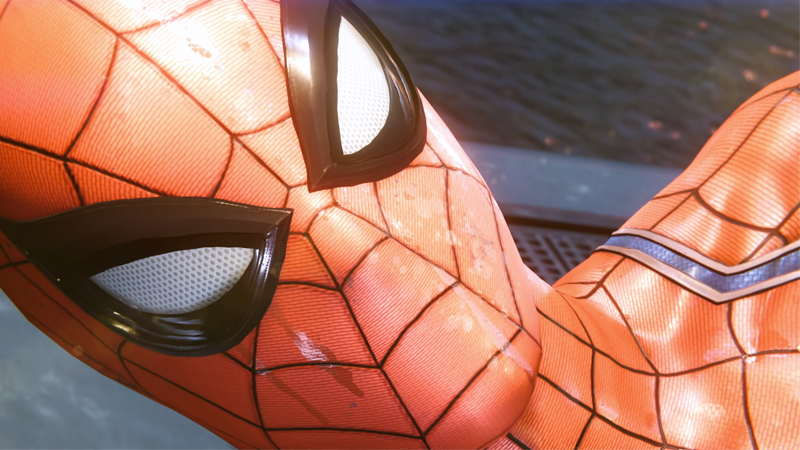 The latest demo for Spider-Man saw the webslinger and his cop pal Yuri Watanabe deal with a breakout on the Raft, the premier floating prison for super-convicts in the Marvel Comics universe. As Spidey swings and punches his way through the breakout, one by one he encounters some of his most infamous foes who’ve escaped in the chaos — Electro, Rhino, Scorpion, and the Vulture — only to learn that they (alongside the previously revealed Martin Li, a.k.a. Mister Negative) are working for a sixth mysterious benefactor. The demo never actually says the name, but it’s clear: The villains of the game are going to be none other than the infamous Sinister Six. 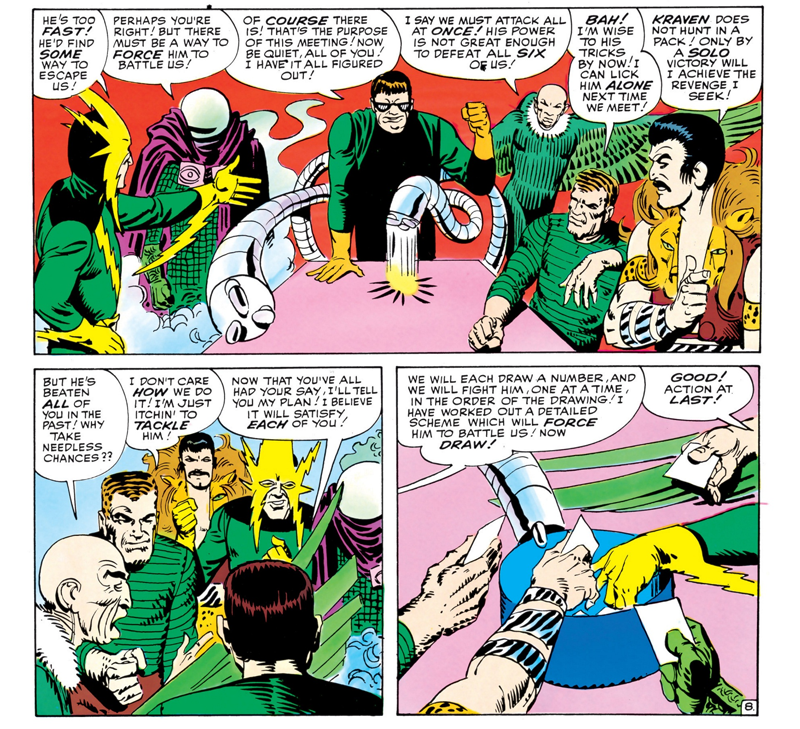 Although in the comics Mister Negative has never been a member of the team, the rest of the villains we saw in the demo all have history with the Sinister Six — in fact, Electro and Vulture were founding members of the group when it was first formed in the pages of 1964's The Amazing Spider-Man Annual #1. The original six — Kraven the Hunter, Sandman, Vulture, Electro, Mysterio, and mastermind Doc Ock — didn’t really form for any particular reason. They mainly just figured that individually they weren’t capable of taking down Spider-Man, so why not set aside their differences in an attempt to get revenge together? However, this decision led to them taking part in what might be Doc Ock’s worst-ever plan: choosing an order in which to fight Spider-Man in, and then doing so one by one in different locations while Octavius kidnaps Aunt May and Betty Brandt. It didn’t go well. But that’s not stopped different versions of the Sinister Six uniting over the decades since their first failed team-up. Pretty much most of Spider-Man’s biggest foes have been associated with the Six at some point over the years, and the team has even expanded beyond a six-villain setup at times. There was a Sinister Seven during the infamous Clone Saga that lead to Spidey teaming up with Kaine (the edgelord antihero/infamous clone of Peter Parker) to take them down, and the Marvel Knights Spider-Man series in the mid-2000s saw Norman Osborn recruit a Sinister Twelve. But what’s never changed is their main impetus for uniting: They’ve all got a grudge with Spider-Man and want to take him down, once and for all. That still seems to be the case in Spider-Man, which features a more experienced version of Peter Parker who’s been operating as a hero for eight years before the events of the game. The new demo sequence lets us know that he’s personally put each of these villains (save for Mister Negative, at least yet) behind bars during that time. But what we don’t know is just who brought them together while they were imprisoned, the real mastermind behind the Sinister Six. We do get some hints though. We know that whoever formed this new Sinister Six also provided each member with new tech-enhanced supersuits to amplify their abilities, for starters. And at the very end of the demo, the mysterious member shows up to heckle a defeated Spider-Man, but they’re unseen to the audience. Peter, however, recognises them with a shock—so it’s likely either someone he knows or another familiar villain to him. Given Doctor Octopus’ long history with the Six, as well as the new suits hinting at a tech-savvy villain, he seems like the most obvious choice. But what would be his connection to Peter that makes Spider-Man so surprised to see him? Plus, we have yet to hear if Octavius is in the game, but another potential candidate is: Norman Osborn. But all that’s been said of him is that he’s currently running a political campaign to be the next New York Mayor, so whether he’s also secretly operating as the Green Goblin remains to be seen. It won’t be long before we get to learn for ourselves — Spider-Man swings onto the PS4 September 7.